"Your word is a lamp to my feet and a light to my path." -Psalm 119:105 Scripture is your guide to what matters most in life. If you're not familiar with it, Patrick Madrid's choice of 150 key verses can ease you in. If you regularly read and pray with Scripture, these verses will provide you rich food for thought. No matter what your situation, the Bible will help you evaluate the choices and make the decisions that confront you every day. Either explicitly or implicitly, Scripture addresses all of life's problems, worries, dangers, questions and uncertainties. 150 Bible Verses Every Catholic Should Know offers you a window into Scripture revealing how God's eternal wisdom relates to your life. 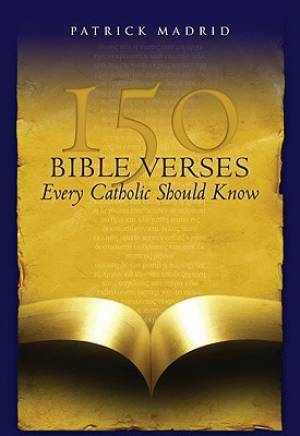 150 Bible Verses Every Catholic Should Know by Patrick Madrid was published by Ingram International Inc in January 2008 and is our 44591st best seller. The ISBN for 150 Bible Verses Every Catholic Should Know is 9780867169027. Be the first to review 150 Bible Verses Every Catholic Should Know! Got a question? No problem! Just click here to ask us about 150 Bible Verses Every Catholic Should Know.